The Ingham County Department of Health and Human Services as well as St. Vincent Catholic Charities unveiled a Peace Pole on June 18th, 2015, in front of the department’s building. The Peace Pole will represent a message of thanks to the refugees and immigrants for making contributions to Ingham County. 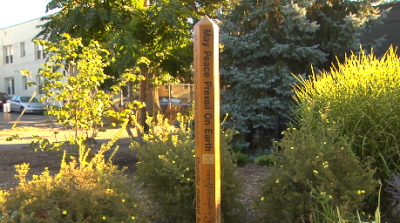 The Peace Pole displays the words: “May Peace Prevail on Earth” in 12 different languages.